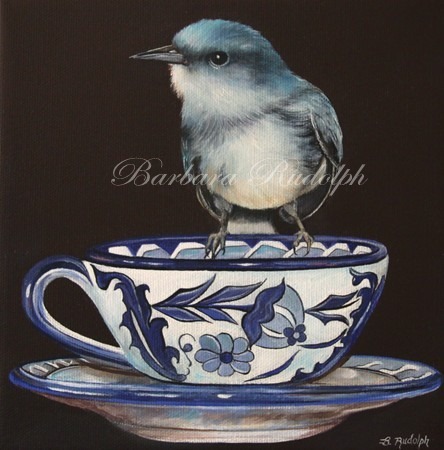 Barbara Rudolph Fine Art: Tea Cup with Bluebird - Oil Painting "Tea Time"
Tea Cup with Bluebird - Oil Painting "Tea Time"
Here is the new companion piece to "The Breakfast Blend" painting. This one is called "Tea Time." The blue and white china cup was from some photographs I took in "Winslow, Arizona" on "Route 66" at the famous "La Posada Hotel." It is "the last great railroad hotel" and is full of history. It was designed by architect Jane Colter. The hotel has been restored and it is a fun little stop to see all of the historic preservation as well as the ballroom and lovely gardens. There is also a wonderful restaurant there called "The Turquoise Room" and the food is amazing. This is where I took the pictures of the old china set. I painted in the little bluebird on the cup and "Tea Time" will make the perfect companion piece to go with your "Breakfast Blend" painting, or wonderful by itself too. I have a special going on now on this "giclee" on board until August 15th. If you place your order before then it is only $75.00. 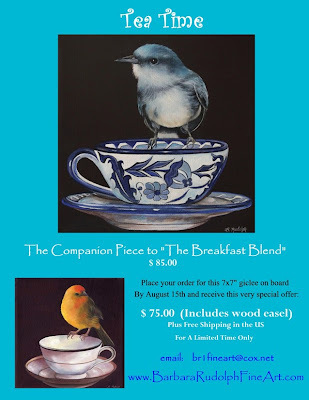 It will also come with a wood easel and free shipping in the U.S. (only until August 15th) It will be at regular price after that. It measures 7"x7" and will compliment any room. It is also a great "gift" size. If you would like to pre-order one now, just drop me an email. wow,this is really beautiful. i am fascinated ! can be. I so love your setup. Such a fragile beautiful cup and the bird is just icing on the cake. Love it.